Each year, millions of people visit the 4,570-meter-high Baishui Glacier in southern China. Scientists say it is one of the world’s fastest-melting glaciers. The huge body of ice is in the southeastern edge of a Central Asian region called the Third Pole. It is about 4.5 million square kilometers in area and holds the world’s third largest collection of ice after Antarctica and Greenland. Third Pole glaciers are critical to billions of people from Vietnam to Afghanistan. Seasonal glacier melts feed Asia’s 10 largest rivers, including the Yangtze, Yellow, Mekong, and Ganges. Ashley Johnson is an energy, trade and economics expert at the National Bureau of Asian Research, based in the United States. She says the Third Pole is one of the world’s largest sources of fresh drinking water. She says an increase in melting from climate change may put that at risk. Johnson said, “Depending on how it melts, a lot of the freshwater will be leaving the region for the ocean, which will have severe impacts on water and food security." Earth is one degree Centigrade hotter than in pre-industrial times. The United Nations Intergovernmental Panel on Climate Change recently reported that that rise is enough to melt 28 to 44 percent of glaciers worldwide. And temperatures are expected to keep rising. Baishui is about as close to the equator as Tampa, Florida. And the effects from climate change are already extreme. A report this year in the Journal of Geophysical Research showed that the glacier has lost 60 percent of its mass. Since 1982, it has shrunk by 250 meters. In 2015, scientists found that 82 percent of glaciers studied in China had decreased in size. They warned that the effects of glacier melting on water resources are becoming “increasingly serious” for China. Jonna Nyman is an energy security expert at the University of Sheffield in England. She said, “China has always had a freshwater supply problem with 20 percent of the world’s population but only 7 percent of its freshwater. “That’s heightened by the impact of climate change,” she added. This Sept. 21, 2018 photo shows glaciologist Wang Shijin at the Chinese Academy of Science glacier station in Linjiang in the southern province of Yunnan in China. 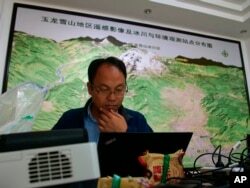 He and other researchers have tracked the Baishui Glacier No. 1. One research team has recorded Baishui’s decrease at about 27 meters per year over the last 10 years. Wang Shijin is a glacier expert and director of the Yulong Snow Mountain Glacial and Environmental Observation Research Station. The station is part of a group of stations run by the Chinese Academy of Sciences. Wang notes that flowers have rooted and grow in the area once covered with ice. The research station that houses Wang and his team is outside Lijiang, a city of about 1.2 million people. The team uses special equipment to collect data on temperature, wind speed and rainfall. Other devices measure water flow in streams fed by melted ice. Cold temperatures, heavy rain, falling rocks, strong winds and glacier movement can damage the equipment. One recent morning the team had to replace a broken weather research station. However, the difficult weather conditions will ensure Yunnan has plenty of freshwater. 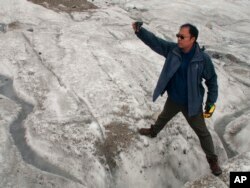 In other areas, glacier loss creates serious risk of a dry period across the Third Pole, Wang said. 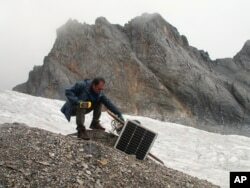 This Sept. 22, 2018 photo shows glaciologist Wang Shijin repairing a broken remote meteorological station on the Baishui Glacier No. 1 on the Jade Dragon Snow Mountain in the southern province of Yunnan in China. The next day, the team had to wear special ice climbing footwear while repairing other research devices on the glacier. Wang spoke of how the area had changed. The team crossed streams and jumped across deep, narrow divides in the glacier. They were looking for some measuring equipment they had placed in the ice earlier. The equipment shows how much the glacier has moved and the amount it dropped in height over the summer. This Sept. 22, 2018 photo shows glaciologist Wang Shijin photographing an ice crevasse in the Baishui Glacier No. 1 on the Jade Dragon Snow Mountain in the southern province of Yunnan in China. One team member launched a camera drone over the Third Pole. The images it captured help tell a story of extreme loss: 25 percent of its ice and four of its 19 glaciers have disappeared since 1957. Wang said such changes to the Baishui glacier provide the chance to educate visitors about global warming. Last year, Yulong Snow Mountain park officials reported that 2.6 million visitors came to the mountain. On a recent windy day, hundreds of visitors climbed wooden stairs to take pictures in front of the glacier. “I don’t think about it now because it still has a long way to go,” he said. To protect the glacier, officials have limited the number of visitors to 10,000 a day and have banned hiking on the ice. China plans to create snow there and block streams to increase the amount of water in the air, which slows melting. Security guard Yang Shaofeng is a member of the local Naxi minority community. 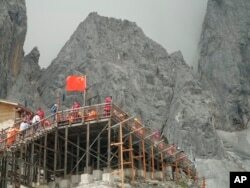 It considers Jade Dragon Snow Mountain to be sacred. Yang says he remembers being able to see the glacier’s lowest edge from his home village. But that time has passed. I’m ­Ashley Thompson. And I’m Caty Weaver. Pete Musto adapted this story for VOA Learning English. Caty Weaver was the editor. We want to hear from you. How concerned are you about climate change? What impact do you think melting glaciers will have on the world? Write to us in the Comments Section or on our Facebook page.